manila fashion observer: Shop U.S. Stores Online with Citi Globeshopper + Win Tickets to Cats, The Broadway Musical! Shop U.S. Stores Online with Citi Globeshopper + Win Tickets to Cats, The Broadway Musical! I have super good news for serious shopaholics! You can now shop US sites, from A.P.C. & Anthropologie to Barneys and Bergdorf Goodman. Yes, even Sephora, Urban Outfitters, Madewell and J.Crew! Basically, all US based sites with your Philippine issued Citibank credit card. Gone are the days when it was frustrating to browse through US e-commerce sites. Back then and (for some until now), even if you saw something you've been searching high and low for, you would come to the sad realization: they won't accept non-US issued credit cards! So you had to ask a family or friend in the US to order for you. Then, the waiting game begins. They wait for the package, you wait for them to ship it to you. Which can take a while, because, well, you either wait for them to bring the package home, or they Johnny Air it to you. You can skip all of that with Citi Globeshopper. Your shopping borders open up to a world of possibilities, and by that I mean, more shops to shop at! 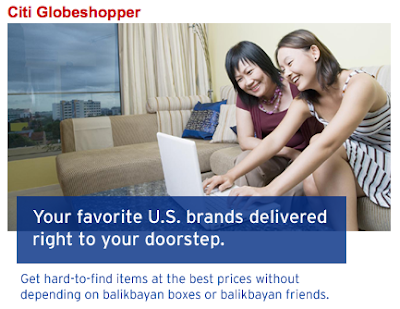 Citi Globeshopper is a service that allows you to shop from US online stores and have the items delivered to your Philippine address. Just register your Citibank credit card (its free!) and you get your own US address to which your purchases will be delivered! For US online stores that only accept US-issued credit cards, you may use the Citi Globeshopper Concierge Service. Simply log in to your Globeshopper account, click on Concierge Service, then complete the order request form with the details of the items you wish to buy. Upon receipt of your purchases at your US address, you can have the items shipped immediately to your Philippine address or you may consolidate your purchases up to one month before having them delivered to the Philippines. 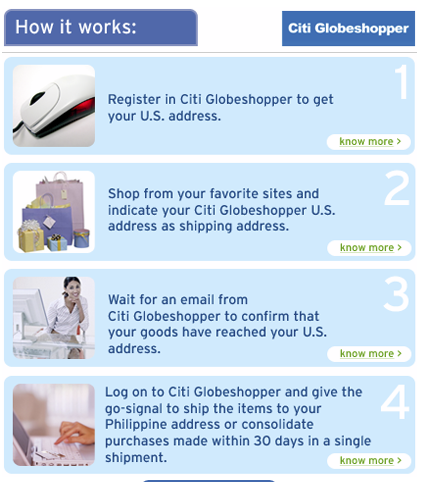 For more information about Citi Globeshopper, check out the Citi Globeshopper website --> here! Now, if that isn't good news enough, when you sign up for Citi Globshopper, you get a chance to watch Cats, the Broadway Musical, featuring Lea Salonga for free! We’re giving 5 lucky winners 2 tickets each for the July 28 show at 8:00pm, at CCP Tanghalang Nicanor Abelardo. Tickets are valued at P2,000 each, and we’re raffling off 5 pairs to those who register on Citi Globeshopper until July 26! All you need to do is complete your registration and choose “Manila Fashion Observer” under “How did you hear about Globeshopper”. 3. Limited to Metro Manila residents, or those who can personally pick up their tickets from the Citibank Program Manager in Citibank Square in Eastwood City on July 27. Winning cardholder must present the Citi credit card and 1 valid ID to claim the tickets. So with these two prospects too good to resist, REGISTER NOW! Remember, registration is free! 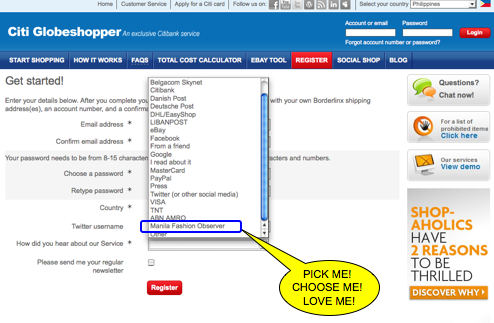 Click --> here and get your own U.S. address for Citi Globeshopper! Don't have a Citi card yet? Apply --> here! Hi Kristine! Yes! Imagine all the shopping possibilities! Heehee! Hahaha Tin! Dangerous but good! Congratulations Aileen!!! Hope you enjoyed!